DC Comics fans are in for a treat. 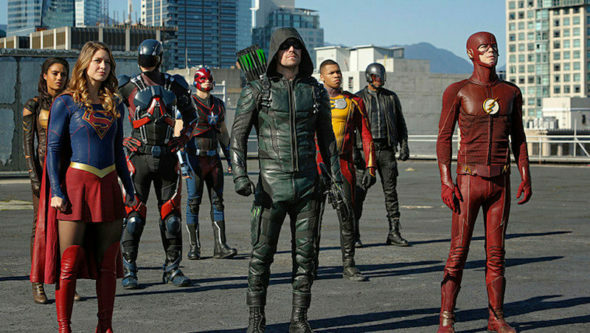 TVLine reports The CW has set the date for another crossover event between Arrow, Legends of Tomorrow, The Flash, and Supergirl. This is not the first time the DC shows have crossed paths. Last year, The CW aired a three-night event across all four superhero dramas. At this summer’s TCA press conference, The CW revealed this year’s four-way DC crossover will begin with Supergirl and Arrow on November 27th and continue with The Flash and Legends of Tomorrow on November 28th. No story details have been released yet. We’ll post updates as they become available. What do you think? Are you a fan of the CW’s DC series? Are you excited about the new crossover event? More about: Arrow, Arrow: canceled or renewed?, DC's Legends of Tomorrow, DC's Legends of Tomorrow: canceled or renewed?, Supergirl, Supergirl: canceled or renewed?, The CW TV shows: canceled or renewed?, The Flash (2014), The Flash (2014): canceled or renewed? Curious to know what Carlos Bernard is doing on the set of Supergirl….